We are proud to offer quality general aviation add-on aircraft models for the X-Plane community. We hope you'll take a few minutes to explore our current fleet of aircraft - we think you'll discover an immersive level of realism with our high-quality models. Click on the "EXPLORE OUR FLEET" link above, or click the product images below to see full descriptions and photo galleries of all of our models. Our own Mario Donick has been taking his flight lessons in the Ikarus C42C (tail numbers D-MSYF and D-MNLN) for the past few months, so we leveraged his knowledge and hands-on experience to create a replica of his two primary trainers. In June 2018, Mario and his friend recorded almost 100 original sound recordings from the real-world D-MSYF and we used all of the sounds in the FMOD configuration for this aircraft. Because Mario flies a real Ikarus C42C, we took great pains to make this model as realistic as possible. Mario provided guidance along the way as to how the real airplane behaves in all aspects of flight. Loaded with features, the model comes with two panel configurations - a "basic trainer" and a "full panel" version. The "basic trainer" is a near replica of D-MSYF, and has a very basic instrument panel with a KRT2 COM radio, Electronic Tachometer, Altimeter, Airspeed indicator, Variometer (Vertical Velocity Indicator), Trim indicator, Magnetic Compass and engine gauges (no NAV radio). Depending on your Options choice, gauges display either metric or imperial units. The "full panel" version adds more instrumentation, including a Transponder, a simulated flymap L EFIS/GPS, a simulated FLARM traffic monitor and a Rotax FLYdat engine monitor. Like the "basic trainer" version, there is no NAV radio - however, it is possible to create a simple 5-leg GPS flight plan using the "vfamap L" with up to 5 legs. The "vfamap L" also provides a moving-map display that shows your GPS flight plan (uses the X-Plane moving map), and an electronic artificial horizon that also displays the next way point information. Both versions are optimized for VR flight, and both include features such as German/English language option, Metric/Imperial gauge option, a virtual, interactive pre-flight walk-around, user-customizable charts that can be "stitched together" to create a large, scrollable chart, pop-out gauges for easier viewing and control, male or female copilot option, pop-up check list, and a virtual "kneeboard" with an Options menu that allows to you select your preferences and remove the ground elements. Custom HDR lighting, PBR rendering effects, highly detailed animation, high-resolution textures, and a realistic ballistic parachute (BRS) round out this feature-rich airplane. A 28-page User Manual is provided. We thank Mario's flight training school flugschule-md.de for their interest and cooperation with this project. 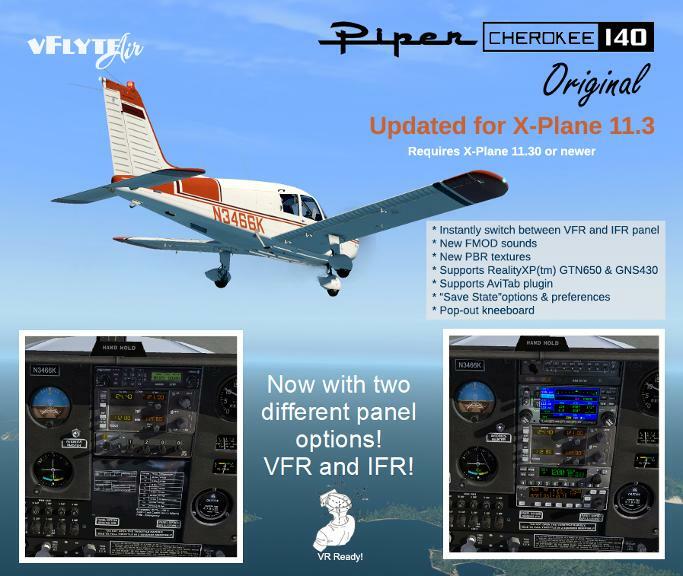 Completely rebuilt for X-Plane 11.30+, the Cherokee 140 Original now features two different panels; the original VFR trainer panel, and a new IFR panel with g430 GPS, Avidyne AXP 340 Transponder and KAP 140 Autopilot. Switch between panels mid-flight! Click on the image above for more photos. ShadeTree Micro Aviation Autoupdate plugin included - keeps your copy up to date! NEW FREE MODEL! 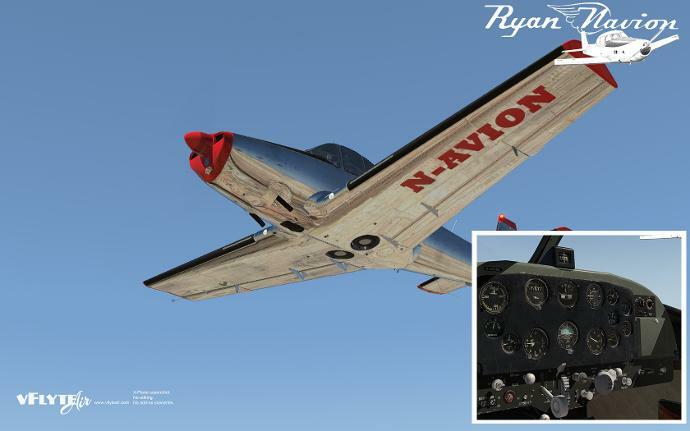 You can download our new Ryan Navion 205 Vintage model for X-Plane 11 for free! Yes, that's right! We are making this 1950 Navion 205 available as a free model for X-Plane. This vintage beauty features period-correct gauges, VR compatibility, FMOD sounds, PBR textures, custom HDR lighting and custom autopilot. Immerse yourself in the golden oldie days of aviation with this classic model. The instrument panel is arranged according to the actual 1950 Ryan Navion POH. You'll love the time-worn look of the Navion with its leather seats, aged glass and well-worn interior. But she still flies great! Featuring a sophisticated simulation of the Cirrus Perspective(tm) avionics package (created by Mario Donick for vFlyteAir), the SR20 model is compatible with X-Plane 11. The newest version has custom airfoils, propeller and flight modeling by Alan Shafto of AeroSimGaming. New FMOD sounds and PBR textures provide the best in X-Plane 11 realism! Ready for X-Plane 11, our Arrow III has support for VR flight,super hi-res PBR textures and a highly detailed animated model! Fly GPS flight plans and ILS approaches with the Laminar Research g430. A realistic GTX327 transponder with four different timer modes, dual OBS gauges and a digital VOR instrument help make this a very capable instrument-flight bird. The Arrow III is a complex GA aircraft with 200HP Lycoming engine and retractable gear. Based on our Cherokee 140 Original version, the Glass Panel model features a simulated Aspen EFD 1000 primary flight display (created by Mario Donick) and is IFR capable. Our Cherokee 140 models are updated for X-Plane 11 with PBR textures and retuned flight performance. Our Grumman Traveler AA5 model has been updated with new X-Plane 11 PBR textures. The Traveler features an STEC System 30 autopilot integrated with the Turn/Bank indicator, dual COM and NAV radios, ADF, DME. The Traveler does not have a GPS, so if you are looking for RNAV and GPS flight planning, try the Grumman Tiger model! The Traveler is great fun for basic IFR and VFR navigation. Based on our Cherokee 140 Original version, the Classic model is IFR capable and has an autopilot and GPS. You can fly ILS and RNAV approaches with the Classic version, as well as GPS flight plans Our Cherokee 140 models are updated for X-Plane 11 with PBR textures and retuned flight performance. Our Cherokee 140 Original was modeled from the real-world Cherokee, tail number N3466K, which I have personally flown on several occasions. The Original is a VFR-only model with traditional analog instruments. If you are looking for a realistic simulator trainer, or simply enjoy VFR flying, this is the model for you! Featuring the original factory-created Bengal Tiger paint scheme, our Grumman Tiger model was modeled from a real-world example located in Texas, USA. Fly IFR and VFR with this model - it comes with an STEC System 30 autopilot intergrated with the Turn/Bank indicator, X-Plane g430 GPS, custom GTX327 transponder, a Terra NAV OBS, HSI, EDM 700 engine monitor and much more! X-Plane 11 ready!